“Acceptance”: a gripping read inspired by middle school, junior, and senior high school students’ dilemmas and successes. “Acceptance” is the creation of published author, Janice Cooley, a wife, mother, grandmother, and great-grandmother, as well as a retired middle school teacher. 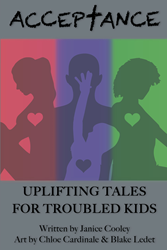 Published by Christian Faith Publishing, Janice Cooley’s new book follows the lives of Callie, Ben, and Ann as they deal with and overcome the relatable struggles experienced by outcasted children. This book depicts heartrending events that will surely tug at the readers’ hearts with empathy and love for everyone but especially those battling with inner wars involving their identity and place in the world. View a synopsis of “Acceptance” on YouTube. Consumers can purchase “Acceptance” at traditional brick & mortar bookstores, or online at Amazon.com, Apple iTunes store, or Barnes and Noble. For additional information or inquiries about “Acceptance”, contact the Christian Faith Publishing media department at 866-554-0919.